Sage Payment Solutions is a multifarious payment processing solution. It helps merchants accept different payment methods in-store, online, and on-the-go. With Sage Payment Solutions, businesses can save time and money by smoothly accepting cards, e-checks, and mobile wallet payments. These various procedures also enable merchants to accept payments from customers with different preferences, so they never have to turn a potential sale away ever again. Sage Payment Solutions also integrates with Sage accounting products to assist businesses in reconciling invoices and payments, synchronizing the frontline with the back office operations. Plus, Sage Payment Solutions is PCI-compliant, EMV-compliant, and secure. It safeguards every transaction against fraudulent activities through tight security measures, ensuring the safety of customers’ financial details and protecting the reputation of the merchant. Sage Payment Solutions enables merchants to conduct business in-store, online, and on-the-go with a single brand. The solution covers all three bases, further assisting entrepreneurs and commercial entities of all sizes to expand their reach and increase their profit margins. With Sage Payment Solutions, merchants can make it more convenient for their customers to pay their invoices. They can simply send a customized invoice to their clients’ inboxes, where they can pay their balances directly through any click-to-pay options included in the invoice. This way, patrons do not have to incur overdue charges businesses also do not have to run into bad debt as a customer can pay online at their convenience and. Sage Payment Solutions makes certain that businesses and their customers do not fall prey to fraudulent acts. That is why it utilizes assorted methods to safeguard transactions, one of which is encrypted card processing such as the Card Verification Value (numbers unique to each credit or debit card a person possesses). Additionally, Sage Payment Solutions is PCI and EMV compliant. This means that it adheres to the highest industry standards when it comes to financial security. Sage Payment Solutions offers terminals and card reading dongles to help businesses further improve their incomes. With those devices, they are able to accept even contactless and mobile wallet payments. This lets them cater to a wider audience and also gives their customers the confidence to transact with them as they do not have to share their card details with them since mobile wallet transactions are protected by tokenization. If you are interested in Sage Payment Solutions it might also be beneficial to analyze other subcategories of Best Mobile Payment Systems listed in our base of SaaS software reviews. Each enterprise has its own characteristics, and can call for a special Mobile Payment Systems solution that will be adjusted to their company size, type of customers and staff and even individual industry they support. We advise you don't count on finding a perfect services that will work for each business no matter what their history is. It may be a good idea to read a few Sage Payment Solutions reviews first and even then you should remember what the software is supposed to do for your business and your workers. Do you require a simple and intuitive solution with only essential functions? Will you really make use of the advanced functionalities required by experts and large enterprises? Are there any particular features that are especially practical for the industry you operate in? If you ask yourself these questions it is going to be much easier to get a reliable app that will match your budget. 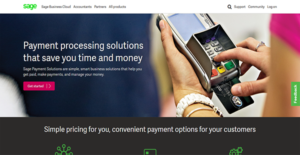 How Much Does Sage Payment Solutions Cost? We realize that when you make a decision to buy Mobile Payment Systems it’s important not only to see how experts evaluate it in their reviews, but also to find out if the real people and companies that buy it are actually satisfied with the product. That’s why we’ve created our behavior-based Customer Satisfaction Algorithm™ that gathers customer reviews, comments and Sage Payment Solutions reviews across a wide range of social media sites. The data is then presented in an easy to digest form showing how many people had positive and negative experience with Sage Payment Solutions. With that information at hand you should be equipped to make an informed buying decision that you won’t regret. What are Sage Payment Solutions pricing details? What integrations are available for Sage Payment Solutions?